37th ANNUAL CONVENTION, SEMINAR AND EXHIBITION ON EXPLORATION GEOPHYSICS 15 - 17 October, 2015, Jaipur, India. AEG aims at publication of the results of original research in the field of Geophysics. Scientific contributions in the shape of original research articles, short communications, case histories involving developments in methodology, techniques, instrumentation, interpretation etc., and discussions on the papers are published by the Association in its Journal and seminar proceedings. 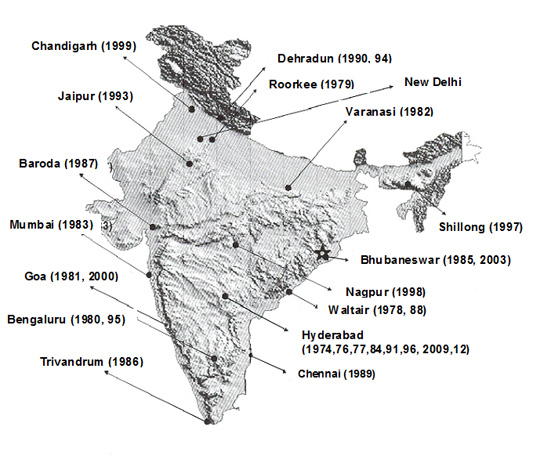 Association of Exploration Geophysicists (AEG) annual seminars are held in different parts of India, where reputed geoscientific organisations / university departments are located. In the process, AEG has been able to enthuse and involve geoscientists on a common platform in different parts of our country. Depending on the geological settings in the region, special themes are identified and papers are invited. ........More.